We received another email form Zurich Insurance today stating that according to the FENSA website the contractors have self-certified that the installed front door meets the building regulations. 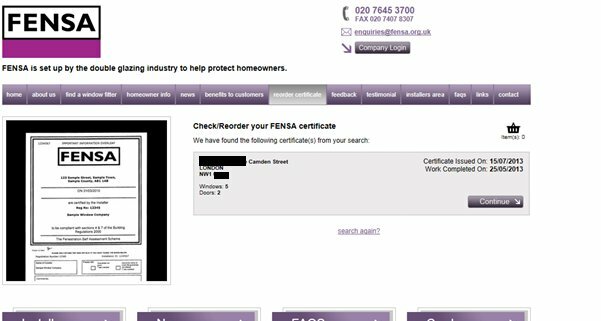 I have made some further enquiries and it would seem that a FENSA certificate was issued for the replacement windows and doors which would indicate that the door complied with Building Regulations at the material time. This extract is taken from the FENSA website. If my understanding is correct, following our recent conversation, Camden Council are replacing your door. You are understandably concerned that contractors working for Camden could cause additional damage to your hall whilst fitting the new door. In the unlikely event, that additional damage is caused, the cost of repairing this damage should be resolved directly between you and Camden Council. I would however be grateful if could keep me informed of developments and the cost of any such decorating repairs that Camden Council are not prepared to meet. The door was supposed to be FD30 according to the regulations introduced by the government on 2006. However the door is not fire proof for 30 minutes because LFB already told the council that it is not. See the deficiency note from them that I have already sent you. Your own contractors, Capital Services Ltd, also confirmed last August that the door is not fire proof. I have already sent you that email. I do not know what the FENSA certificate proves apart from the fact that GAB Robins has installed a door. Why GAB Robins Ltd broke the law by installing a door which did not meet the current regulations and then SELF-CERTIFIED it? Where the evidence showing that I have agreed to an illegal installation?